Ed Del Grande » It Was A Good Thing! I recently made an appearance on the Martha Stewart Show on behalf of Kohler Standby Generators. Pictured here, left to right, are Todd Weber (PR, Kohler), Martha herself, and Yours Truly. You can visit marthastewart.com or kohlersmartpower.com to get more information on the TV appearance and Kohler generators. 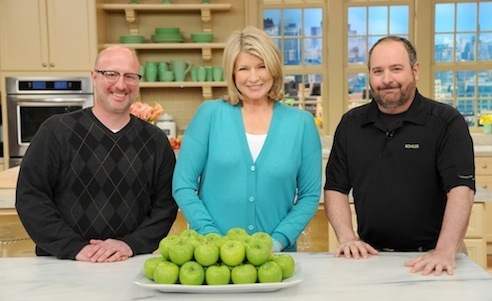 Ed Del Grande working with Martha Stewart… how do you like them apples? !